How does the UK state pension compare worldwide?. It’s extremely difficult to make a like-for-like comparison between nations’ pension schemes, as each country has different qualifying criteria and ways of calculating your entitlement. However, despite this, our snapshot survey shows some marked differences. While the Swedes enjoy a maximum state pension of just over £25,000 a year, South Africans get a maximum of £1,044. And although Britain’s current basic state pension of around £5,500 a year leaves it near the bottom of the league table, government reforms will see this rise to almost £7,500 (in today’s money) in 2016. It’s important to remember that you can’t look at a country’s state pension in isolation. How much tax people pay and what they get for their taxes are inextricably linked to the issue of pensions. Another vital consideration is the average salary for each country. For example, a yearly pension of £1,044 in South Africa might not seem quite so low when you learn their average annual salary is £7,421. Support for private pension saving is another key issue. Like Sweden and the Netherlands, the UK’s private pension coverage boosts its meagre state pension. State pension age is also a controversial subject in the UK. For many years it was 65 for men and 60 for women, but it’s increasing to 66 for both genders by 2020, to 67 by 2028 and will rise in line with life expectancy thereafter. But the UK isn’t alone in increasing state pension age – of the 34 Organisation for Economic Co-operation and Development countries, 28 others intend to do the same. 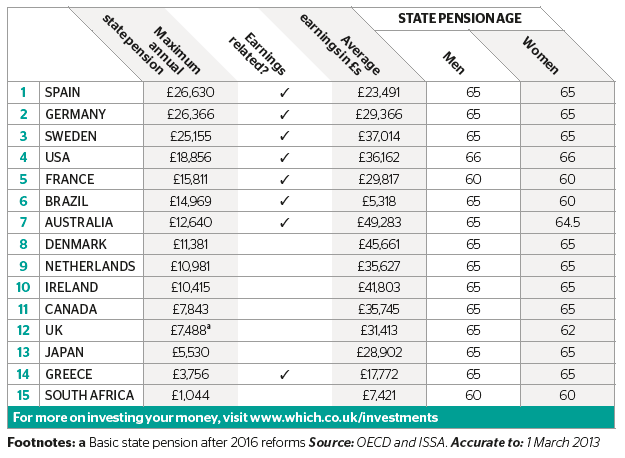 And now you can find out how the UK compares to other state pension around the world in our table below. The table shows the maximum annual state pension you can get in 14 countries compared with the UK (post 2016 reforms), including whether or not it is linked to your earnings, the average salary in each country and the age for both men and women at which payments begin. Click the image to enlarge.